Andy Kehoe is an American artist, born in 1978, and raised in Pittsburgh, Pennsylvania. He is known for his contemporary surrealistic landscape paintings, which sometimes feature animals and fantastic anthropomorphic creatures. His enchanting pieces are brimming with childlike innocence, and resemble a storybook full of magic, monsters, and unsolved mysteries. Intriguing characters are intertwined in the nature around them and bonded with it. The young artist was a great fan of comics, cartoons and storybooks, and spent his childhood days immersed in the imaginary worlds. His childhood heroes were fictional characters, such as Luke Skywalker and Indiana Jones. Kehoe enjoyed watching movies with an edge of darkness, so his favorite movies were Fantasia, Legend, The Neverending Story, Willy Wonka and The Chocolate Factory, Gremlins and The Secret of NIMH. Being of mixed heritage, young Kehoe could relate to the counterculture, such as comics and skateboarding. When he graduated from high school, Andy researched various art schools and opted for illustration course at Parsons School of Design in New York, where he later earned his Bachelor of Arts in Illustration in 2003. Upon completing his studies, the artist did commercial illustrations for a while but then decided to dedicate himself to his personal artistic career. 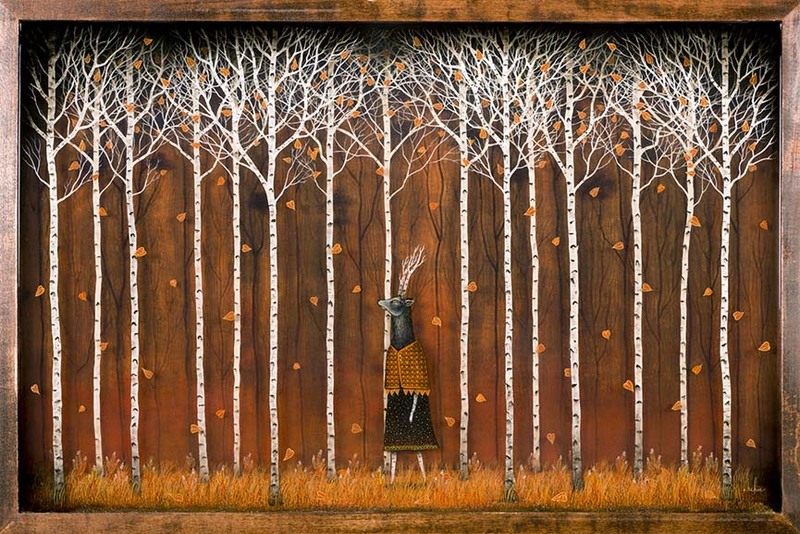 Andy Kehoe creates his paintings with several layers of resin, building an image layer by layer, in order to create a three-dimensional effect, and give his pieces depth and complexity. His art shows sincere human emotion and serves as an outlet for feelings. The quiet, visual narratives are influenced by mythology, folk tales and the beauty of nature. They center around themes such as love, betrayal, alienation and mortality. His paintings, rich in detail, depict hybrid figures, part-animals, part-humans, inhabiting a strange, mystical forest world. The cartoonish aesthetic and deep colors resemble fairy-tale storybooks and evoke the sense of nostalgia. These compelling and haunting works fuse childhood fantasies and adult nightmares, giving a suggestion of narrative and leaving the viewers to wonder what lies beneath the surface. The artist employs dramatic light and contrasts, intense colors and strange creatures, in order to create additional tension and mystical, haunting atmosphere. 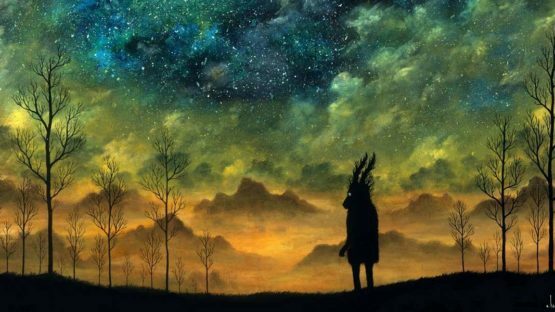 The ultimate goal of Andy Kehoe is to add a bit of wonder and imagination into the lives of viewers, and in a way, transport them to places they haven’t seen before. Kehoe is also inspired by other artists, such as Michael Page, Esao Andrews, Josh Keyes, Martin Wittfooth, Souther Salazar, Aron Weisenfeld, and Corey Arnold, and many more. He has exhibited his paintings in many solo and group shows throughout the United States, in the cities such as Los Angeles, New York, Chicago, Seattle, and Portland, and internationally in Canada. Andy Kehoe had one zygote solo exhibition titled The Safest Place in the World at Green Lantern in Chicago, Illinois, with his identical twin brother, Beh Kehoe, who is also a visual artist. The venues where he exhibited include Thinkspace in Los Angeles, California; Dunedin Fine Art Center in Dunedin, Florida; 1988 and Nucleus Gallery in Los Angeles, California. The New York Times, The Progressive, The Stranger, Fantagraphics, and Metropolis are some of his clients, who commissioned his illustration work. He is represented by Jonathan Levine Gallery in New York. Andy Kehoe currently lives and creates in Pittsburgh, Pennsylvania.